The ill effect of plastics on our environment is well known to us. Plastic forms an integral part of our lives, a lot more than we thought it would. Today, plastic has become so prevalent that we find them everywhere, even inside the bodies of marine animals. And yet, despite all that we learn, we fail to implement measures to cut down its adverse effects. Denying it? Okay, when was the last time, you bought something to drink packed in a plastic bottle, and after consuming it, threw away the empty bottle without a second thought? Still in denial mode? On an average, we individually use 168 plastic bottles each year, and more than half of them are not recycled. And where do they go? Either dumped over land or end up as a part of marine debris. Studies find that as many as 65 million empty plastic water bottles per year end up as garbage in a landfill site, which take a thousand years before they are fully decomposed. Plastic bottles are made from a petroleum product known as polyethylene terephthalate (PET), and they require huge amounts of fossil fuel to both make and transport them. We need to look for ways through which these harmful plastic bottles can be transformed into a useful resource. Fortunately, volunteers of an NGO, Samarpan Foundation, have found an interesting way. They take up these used PET bottles, sort them according to their size, fill them with mud, and use these as a replacement for conventional bricks in the construction of houses! The project coordinator at Samarpan says “Bricks are expensive. Here bottles, filled with mud and capped tightly, will be used in their place. After being laid out, the walls are plastered. The mud and the plaster provide double insulation and help keep the house cool. This project demonstrates the optimal use of waste. PET bottles do not disintegrate and remain intact for around 1,650 years. They trap harmful dioxins and don’t release them into the air. The house we are building is eco-friendly, solar-powered and, at night, will use water turbine energy.” Samarpan has already constructed a school in Delhi, using 6,000 PET bottles; and this NGO is not the only one doing this. The Indian armed forces stationed at the Siachen border use mud-filled jerry cans in large numbers to construct living units. Similarly, the walls of dams and wells in Goa have been reinforced through this method. A mud-filled bottle is as strong as a brick and has many other advantages. It forms a valuable alternate building material. Low cost and maintenance, along with its long life, gives the advantage of excellent value for money. PET provides very good alcohol and oil barrier properties and generally good chemical resistance. The orienting process of PET serves to improve its gas and moisture barrier properties also. PET bottles are non-biodegradable. Therefore, any structure made with it can last a couple of hundred years or more. And then at the end of its life, the structure may be recycled and reused once more! Plastic has high tensile strength to weight ratio which makes it strong, durable and versatile. 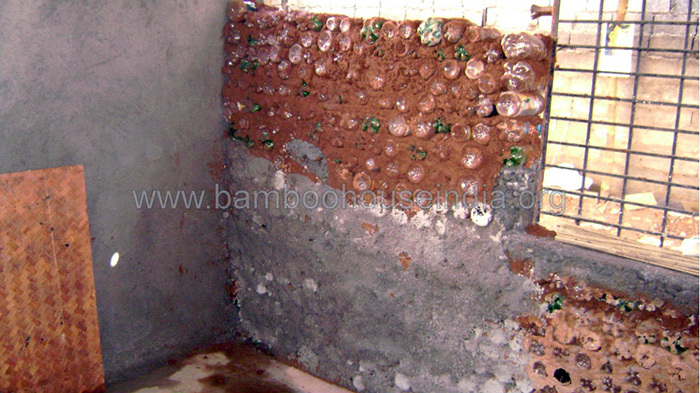 PET Bottle walls act as heat insulators as well. Moreover, mud-filled PET bottles are non-brittle and can withstand heavy shock loads. In earthquake prone and flood affected areas, plastic bricks structures with its high-impact resistance can prevent large-scale damage. Replacing conventional bricks with plastic bottles will help the environment in many ways. Waste will be greatly reduced as bottles become a resource and attract value. Improved sustainable management of plastic bottle waste will reduce the pollution of land and water bodies. It will help reduce carbon emissions spent during baking of clay bricks and also lower the demand for conventional construction materials. 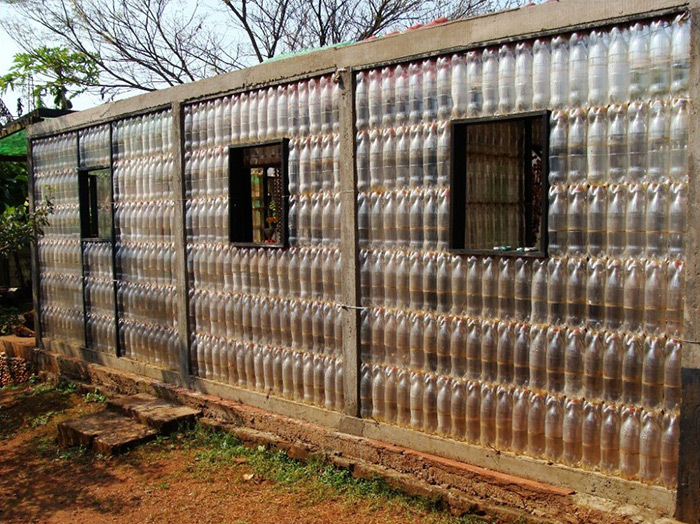 This eco-friendly initiative of building houses through PET bottles needs to catch up with time. People need to shed their apprehensions and more of such houses need to be built for the greater good of the society and the environment. So the next time you throw away that plastic bottle, think again! what is the aprox cost for biulding a 2 bedroom house. will u take up projects in rural areas. Hi. Can i know how many bottles are needed to build one complete house? Thank you. Nice initiative. We have also similar ideas. Is that possible for you take up any assignments and build a room or two for tuition center for school students in outskirt of Chennai, Tamil Nadu. Thanks for this wonderful ideas. I am also thinking about to use in my project. great idea! 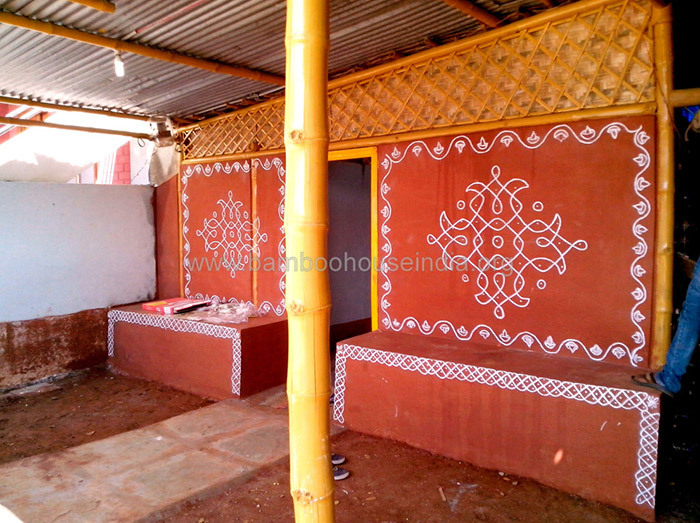 we can also constract eco-friendly toilets also with low cost! HI, I need to partner up with you for a project in Uganda. I collect over 1000kgs per month. thx.